PERFECT FUNNY GIFT – Original “If You Can Read This Bring Me Some Gin ! ” Funny Socks by Luxe. Printed with anti-slip material ensuring safety with a drink! For that special Gin lover in your life, surprise and excite with this one of a kind gift for her. The look on their face will be priceless, make them squeal with joy! LUXURY MATERIAL TO GOOD TO TAKE OFF – Thick Fuzzy Stretchy Cotton Velvet Blend Super Soft To The Touch Keeping Your Feet Toasty Warm Always. Perfect for Lounging, Ideal Birthday Present for mum, wife, sister, coworker, colleague, party favour, bride, or present for a girlfriend, friend or yourself! NOVELTY HOSTESS OR HOUSEWARMING GIFT – 30 Day Courteous Money Back Guarantee LUXE is always here to help you. Funny Bring Me Gin Socks will amaze and make them laugh ! Receive complement after complement or perhaps the perfect drink with its unique message. 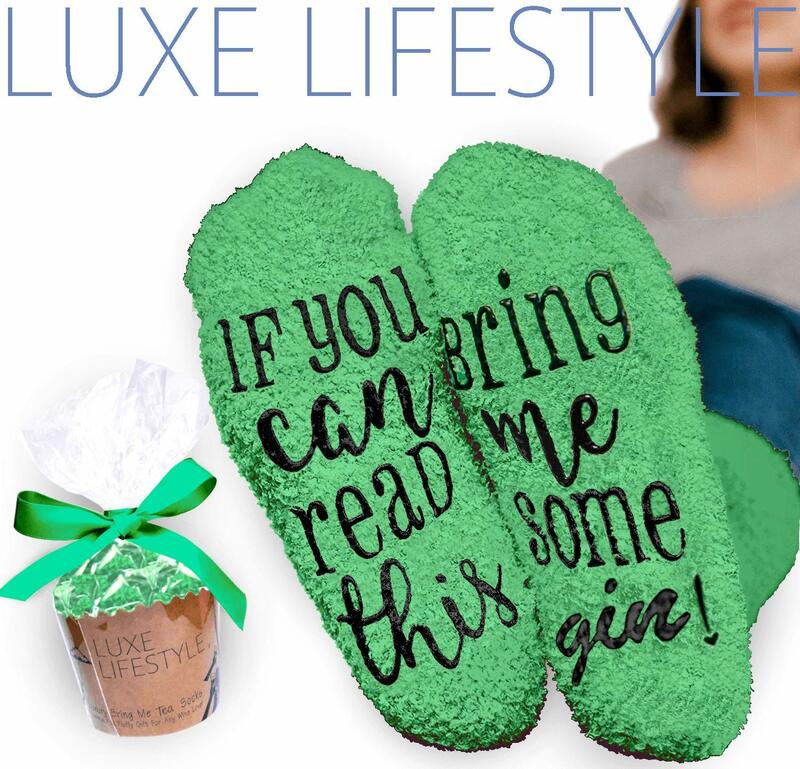 Treat someone special including yourself to these luxurious Gin socks designed to fit most average UK sizes. ✔ The cotton spandex material allows for machine washing and stretching per foot offering the perfect all round size. ✔These socks offer the very funny message if you can read this bring me some gin ! a guarantee to make them laugh! ✔A perfect item to prove a point and get that drink you want! These Gin socks are a unique funny gift for those special occasions. This time bring a gift that will stand out with a lasting effect and imagine the reactions of your loved ones! Perfect for pamper days , birthdays , couples , housewarming , mothers day , hostess , housewarming gifts & valentines! ADD TO CART, Enjoy and Stay Warm for A Lifetime!!! If this item arrives defective or breaks due to no fault of your own, we will replace it 100% free of charge. UNIQUE FOR ALL OCCASIONS – More then just a birthday gift for her, no matter what occasion, housewarming, engagement, bridal shower, hen, wedding, 18th birthday gift for daughter, anniversary, drinking games, secret Santa, Grandma Gifts, Grandpa Gifts, best friend gifts, Valentines, Christmas, Mothers Day or any other. Essential Gin gift. THERMAL WARM & ONE SIZE – ‘Feels Like Cushions for Your Feet’ Keeping Yourself Friends and Family Warm , ADD TO CART & Give Relatives What They Deserve!